Lon Marum is a documentary film depicting the relationship between language, culture, place, music, tradition, and magic – in the context of life on an active volcano. 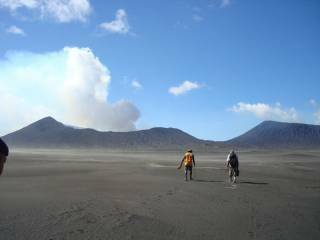 Filmed on Ambrym, Vanuatu, it is the story of one of the most active volcanoes in the world, told by the people who have the longest relationship with it. The film is the result of a two year joint collaboration between Chief Filip Talevu and anthropologist and film maker Soraya Hosni. Each scene was filmed in vernacular language as well as the national language with a result of 7 languages featured by 7 communities. These communities have some of the most complex kinship systems in the world, described by languages on the very brink of extinction, in one of the most linguistically diverse regions on the planet, About 200 people took part in one way or another to make this project possible. The one-hour film presents creation stories, tragic eruptions, sand drawings, accounts of foreign invasion, and the quest for a better understanding. We hear from local scholars attempting to stem the erosion of their knowledge values, and from scientists grappling with the idea that they might have something to learn. The film is written and directed by Chief Filip Talevu and Soraya Hosni. Soraya Hosni is a visual anthropologist and Chief Filip Talevu is a community leader and ethnographer.